Dubai, United Arab Emirates - 4 April 2018: GROHE, the world's leading manufacturer of sanitary fittings, welcomed the 100,000th visitor to its innovation tour through Europe and the Middle East. GROHE employees congratulated Muneem Al Fashtaki in front of the GROHE XXL truck in Jeddah, Saudi Arabia. 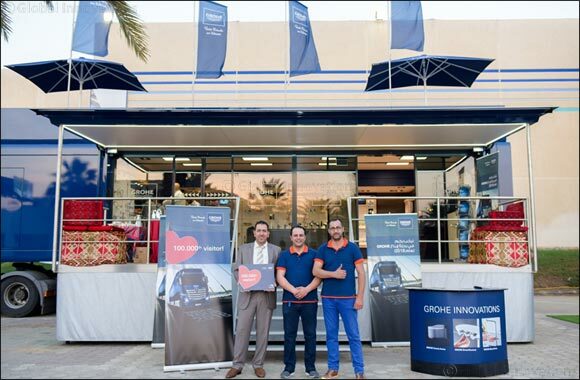 The sales manager of Al Falaj Trading Est., a medium-sized distributor of the region, visited the mobile showroom in order to find out about the latest GROHE innovations. Representing all visitors to the GROHE trucks, he received a small gift of a GROHE Power & Soul shower set that allows switching between four different spray patterns by one click. Since March 2017, GROHE has been on the road in Europe and the Middle East with a total of four mobile showrooms. So far, the trucks have covered approximately 150.000 kilometres in 33 countries. The current route equates to more than three circumnavigations of the world. Inside the trucks, private and professional visitors can gain insights into GROHE’s latest innovations, test the products and take part in open trainings. For 2018, about 800 information events are planned. From AquaSymphony, the most luxurious shower in the world, to the GROHE Blue and GROHE Red water systems, to the GROHE Sensia Arena shower toilet and our smart water sensor and control unit GROHE Sense and SENSE Guard: GROHE’s latest product highlights can be found in the XXL trucks. They are there so that the visitors can familiarize themselves with the products and try them out. In addition, a team of specialists gives advice in personal expert discussions on product features and offers useful installation tips.